Hilgenberg, stimulated by the pioneering work of Wegener on Continental Drift, has been attributed as being the first model maker to fit all of the present-day land masses together to completely enclose a small papier-mâché globe. In 1933 his work was published in his classical work “Vom Wachsenden Erdball“ [About the growing Earth]. On each of his globes all oceans were progressively eliminated and the remaining continental crusts eventually enclosed the entire Earth on a globe at about 60 percent of the diameter of the present Earth. 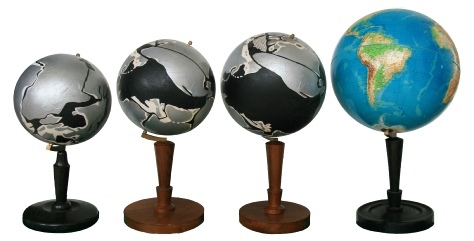 Reproductions of Hilgenberg’s Expansion Tectonic Earth models, attributed to being the first small Earth models constructed. Size of the small globe to the left is approximately 60 percent of the present Earth shown on the right. As can probably be seen on his globes the main limitation to accepting Hilgenberg’s reconstruction was the purely visual fit-together of continents across each of the oceans? In 1990 Vogel commented that, “…though fairly exact in several regions, the totality of Hilgenberg’s result was not entirely convincing because, especially in the Indian, Pacific, and Arctic Ocean regions, numerous gaps and overlaps appeared between continental fragments.” Hilgenberg also gave no explanation for the creation of the oceans, nor an explanation as to what happens to the present-day volume of seawater on a much reduced radius Earth. More specifically, Hilgenberg’s reconstruction across the Atlantic was considered to be convincing, however difficulties were encountered in the Indian Ocean due to a greater dispersion of continents and an uncertain initial position of India and Madagascar. The Pacific region was the most difficult to reconstruct, as workers to follow also found. Unlike the Atlantic and Indian Oceans, where the borders of these oceans retained their shapes, the Pacific borders were considered by Hilgenberg to have opened much earlier and hence the shape of these borders remained tectonically active throughout the continental dispersal times. Hilgenberg postulated that the mass of the Earth, as well as its volume “…waxed with time.” Because of this stance and the several problems inherent in his reconstructions, Hilgenberg’s ideas on Earth expansion were largely ignored and he has since received scant recognition for his efforts.